The flowers in the image above have been greatly reduced. Not all are shown. 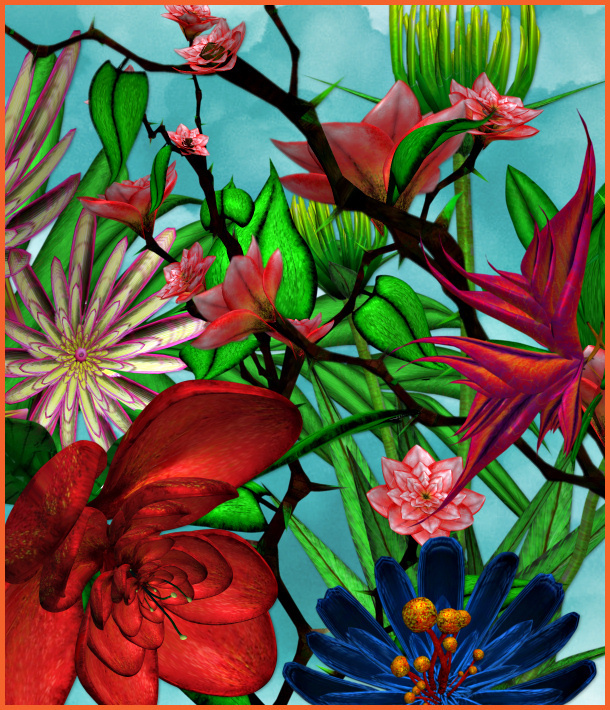 Lovely and unusual blossoms for your creations. Imagine a fragrant garden that’s so peaceful and lovely that it holds you spellbound and touches a place deep inside that revitalizes your soul and inspires sweet dreams. Such a mythical garden can be yours. All you have to do is build it with the seeds of your imagination and the help of this package of unique and vivid flowers. Its fair blossoms include, Blue Dahlias, Geraniums, Orchids, Roses, Poppies, Posies, Tulips, and Pink Lilies fringed in a plethora of serene green. Each blossom holds such magic that they might have sprouted from the pages of a beloved fairy tale. Even the lazy Dandy Lions hold unforgettable beauty and will be great for countless design projects. Use them to decorate a scrapbook page, for web design, or simply to create dazzling floral designs that cultivate a garden spun of dreams. The seamless background tile on this page is also included in this package. This package is two zip files, which are approximately 25-27 MB each.